Tarantulas are so big that the leg span of some species is 11 inches. They’re hairy, with barbed hairs that are sharp enough to kill small mammals. Tarantulas have large, visible fangs and an exoskeleton that protects them like body armor. Humans aren’t generally afraid of scary-looking tarantulas. They scoop them up to sell in pet shops, and some humans even roast and eat the large spiders. But tarantulas have natural enemies too. Smaller mammals must take care to avoid being eaten by tarantulas, but many larger mammals consider tarantulas a tasty treat. Coyotes, foxes, weasels and skunks have been spotted eating tarantulas. Often a mammal that messes with a tarantula gives up quickly. 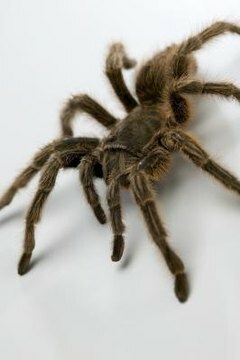 The barbed hairs and agile movements of the tarantula can cause a mammal to wonder if all the trouble is worth it. Large lizards and snakes enjoy a tarantula meal on occasion, though they have to be choosy about the individual spider they decide to pursue. Sometimes tarantulas can actually eat lizards or snakes -- even big ones. Hawks, eagles and owls also dine on tarantulas. One of the biggest enemies of the tarantula is the tarantula hawk wasp. This large wasp searches for a tarantula, finds its burrow and then lures the spider out. The wasp then darts in and stings the spider in a vulnerable spot, such as a leg joint. Once the tarantula is paralyzed from the wasp venom, the tarantula hawk wasp drags it into a lair, or sometimes even the tarantula’s own burrow. The wasp lays an egg on the spider and then seals up the burrow. When the wasp maggot hatches, it eats the tarantula and then emerges from the burrow as a fully mature wasp. Some flies lay eggs on tarantulas. When the eggs hatch, the larvae burrow into the spider, eating it from the inside. As they pupate and turn into flies, they burst the abdomen of the tarantula, killing it. Tiny mites also feed on tarantulas, though they don’t typically cause death. One of the best defenses tarantulas have against predators is the special hairs located on their abdomens, called urticating hairs. The hairs are barbed, and designed to stick in the skin, causing irritation and even death. Some tarantulas can launch these hairs into the air, aiming for the predator's eyes. Other species simply press the hairs into their enemies.